Only in November, Israeli govermental bodies, military and settlers together have been responsible for uprooting and destroying 786 olive trees, approving the establishment of 2680 settlement units and confiscating 5248 dunums. The political context in November was marked by the continuous - futile - negotiations between the Palestinian Authority and the Israeli Government, the volatility of the regional situation which distracted attention from the Palestinian cause. Yet, the Occupation's expansion and ethnic cleansing policies are ongoing: the month saw the distribution of 300 demolition notices, 200 notices were in Jerusalem district, 68 in Hebron district, 11 in Jenin district, 6 in Tobas district, and 2 in Khirbat al Taweel in Nablus district. 11 houses and facilities were demolished. 3 demolitions were in Ithna in Hebron district, two houses in Khirbat al Taweel in Nablus district, and five houses in Beit Hanina and in the Old City in Jerusalem were demolished. The Occupation Government approved the expansion of settlements in the occupied West Bank and Jerusalem in order to build 2689 additional settlement units, 283 settlement units in 'Alkana' settlement, 114 in ' Ma'ale Adumim', 196 in ' Kirne Shimron', 102 in ' Giv'at Zeev', 18 in 'Ariel', 80 in 'Adam', 238 in 'Bitar Elet', and 30 in 'Beit Eel'. In Jerusalem there were 311 in 'Gilo', 378 in 'Ramat Shlomo', and 130 in 'Harhoma'. The Occupation forces confiscated 5248 dunums of land: 2005 dunums in Nablus district, 2670 in Yatta in Hebron district, 500 in Kafr el Deek in Salfiet district, and 78 dunums were annexed by the Wall in Tulkarm district. Concerning the continuous Judaization of Jerusalem, the Occupation Government continued razing, and confiscating lands in Haouch Al Shahabi near Bab Al-Hadeed, one of Al-Aqsa Mosque's gates, for the implementation of "Kadam-Eer David complex" aiming at establishing a tourist building, and approving the establishment of a "National Park" that has an area of 750 dunums taken from the City's lands. In addition to establishing a new Jewish synagogue inside the tunnels drilled under the holy Al-Aqsa Mosque, as well as the Knesset's debate on the law that legitimize Jewish prayers inside Al-Aqsa Mosque. Settlers continued to attack Palestinian citizens and their properties under the protection of occupation's army. November 2013 witnessed the destruction and uprooting of 786 olive trees in different West Bank districts. The table below provides information on most settler's violations during November 2013. Bid advertisements for 1859 new settlement units over the existing ones in both West Bank and occupied east Jerusalem. The bid is providing for 828 settlement units in east Jerusalem in the settlements of Ramat Shlomo, Gilo, and Abu Gneem mountain. Occupation government issued bids to build 1031 settlement units in Ma'ale Adumim, Givat Zeev, Bitar Elite, Jebe bn yameen, Adam, Ariel, Alkana, and Karne Shemron settlements through the Ministry of Housing. 48 years old Jameel Ahmad Elayaan, and 45 years old Saeed Admad Awaad were arrested on the pretexts of attacking the occupation army. 40 olive trees that belongs to the citizen Mnor Ali Al Shaeer distributed on an 8 dunums area of land close to the settlement. Breaking-in three houses that belong to Al-Shireef, Abu Sneeneh, and Qafesheh families under guard of Israeli army. They brought construction materials and equipment to work in these buildings in order to build a new settlement building that is considered to be the closest to Al-Haram the Ibrahimi Mosque- the Tomb of the Patriarch. A bulldozer belonging to “kiryat Arba” settlement began to build a dirt road that extends eight meters, in order to expand “Hafat Gal” settlement that settlers started to build many years ago. Setting fire in a BMW car belonging to the 60 years old citizen Abd El Mneem Salaymeh, and a (FIAT – 127) car belonging to the 45 years old citizen Mohammed Adam Salaymeh; settlers wrote threatening graffiti that says: “Beit Een settlement soldiers” on the walls of the house in Jalajel village east of Hebron. Settlers living in the settlements surrounding Tekoa village close the routes used by citizens. Burning of the house of Khalid Abd El Rahman Dar Khleel. Uprooting 75 olive seedlings in the agricultural region Al Sabeha east of the town. Cutting 106 olive rees, belonging to Meseaf family, in Wad Mean area east of Yatta, using manual saws. Uprooting 38 olive seedlings, that are between the ages of one to four years. Setting fire in a truck and a vehicle belonging to Bahjat Mohammed Sliman, that were parked as usual near his place. Attacking citizens as they were heading to their lands, some were bruised and they arrested five people, including children. Settlers threw things on passing cars. Cutting trees belonging to the 65 year old Abd Allah Mohammed Omar. Throwing stones and Molotov cocktail on Ghassan Mustafa Zahran’s house burning it. 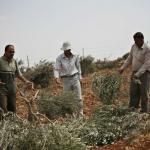 30 settlers cut 200 olive trees that are between the ages of 30-60 year. 150 settlers threw stones at Palestinians in 60 Street under the protection of occupation’s army. Settlers gathering and attempts to attack a village.